I exaggerate a bit, but let's just say that seamless continuity isn't a priority for Suzuki and, also, I wasn't exaggerating at all. 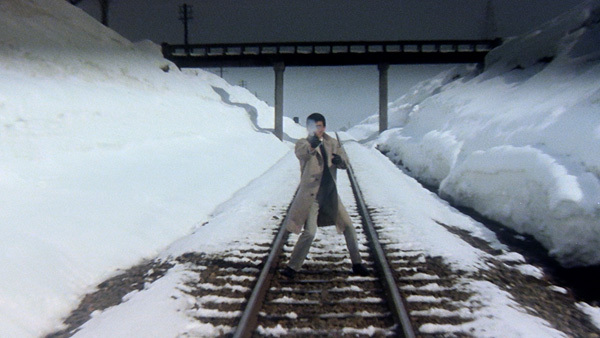 One of the greatest pleasures of watching a Seijun Suzuki's best films is the comforting knowledge that you cannot possibly know what image you're going to see next. A killer preparing for his climactic showdown with the enemy may suddenly decide to bounce a balloon around his apartment. Two may men may suddenly walk into a bathroom locked arm-in-arm. A car chase begins and before you've figured out who's driving or if there's even another car involved in the chase, it's already over and we're back at the nightclub. Are those two gunmen engaged in a shootout to the death or are they just two guys who happen to like guns? Are they even in the same town? Screen geography, in Dude-speak, is just, like, you opinion, man, and when Seijun Suzuki wants your opinion, he'll tell you what it is. And you still might not understand. But you'll love every second of it. Unless you don't. 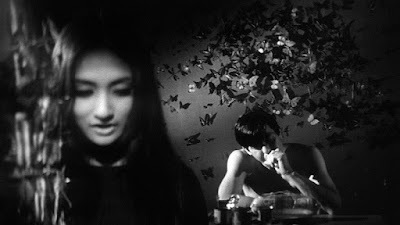 One of the more irritating aspects of watching Seijun Suzuki's best films is the discomforting knowledge that you cannot possibly know what image you're going to see next. The barrage of disorienting, off-kilter compositions can lead to sensory overload and exhaustion exacerbated by the lack of the familiar guideposts provided by more traditionally and coherently structured narratives. I sometimes wonder if Suzuki could have made the greatest 60-minute films of all-time. Not that he dawdles - “Tokyo Drifter” clocks in at a brisk 82 minutes, and “Branded to Kill” (1967) at just 91 – but his Red-Bull-charged cinema can lead to a nasty crash and burn, a deflationary death by a thousand little catharses, so be careful not to overdose. Unless you want to. 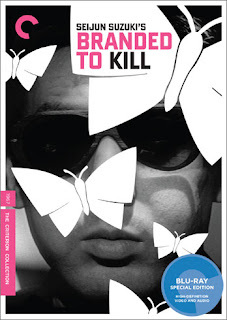 “Tokyo Drifter” and “Branded to Kill” represent Suzuki at his creative peak. He had made a name for himself furiously cranking out three or four B-movies per year at Japan's Nikkatsu Studios in the late '50s and early '60s, drawing particular attention after the success of increasingly kinetic and violent films like “Youth of the Best” (1963) and “Gate of Flesh” (1964). 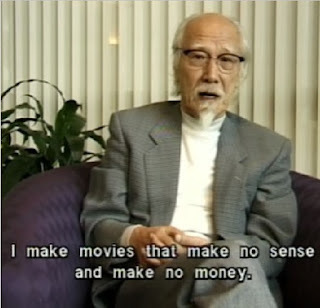 As Suzuki's creative control over his project grew so did his penchant for formal, genre-bending experimentation, and so did the studio's frustration with a director it couldn't easily pigeonhole or comfortably market. Can't you just make us a nice, normal movie? Sorry, Mr. Studio Executive, I'm afraid you'll have to go to hell! Suzuki kept exploring previously uncharted stylistic territory, skirting the boundary between commercial and avant-garde (with a bullet), until “Branded to Kill” proved to be a breaking point for Nikkatsu. The studio chose to rid itself of this troublesome director, canning Suzuki for alleged insubordination, upbraiding him for his “incomprehensible” films, leading to a protracted legal battle and a decade-long blacklist that terminated the most prolific part of Suzuki's career, though he would gamely bounce back with a few late-career gems, my favorite being his underrated tour-de-force “Pistol Opera” (2001). 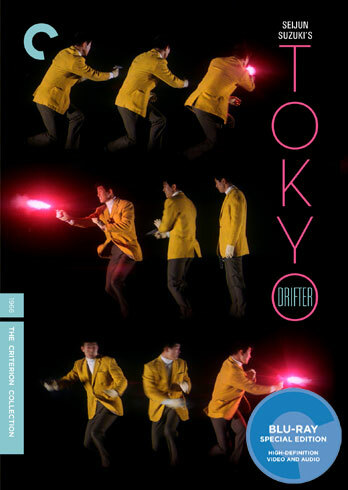 “Tokyo Drifter” and “Branded to Kill” are sometimes thought of as a paired unit, though they are actually radically different films, the first a neon-jazz color explosion. Both offer bare-bones distillation of yakuza plots. The main character in “Tokyo Drifter” (Tetsuya Watari) becomes an underworld target while staying loyal to his master; the protagonist in “Branded to Kill” (Joe Shishido, a Suzuki regular) is currently the third-best assassin in Japan (apparently they keep meticulous rankings) and he'll do anything to move up the charts, but finds it difficult to climb the rankings after he screws up a job. Also he really, really likes to sniff boiling rice. But enough about the plot and the characters and other irrelevant nonsense. Suzuki's best films are about outrageous set designs, endless fracturing of the visual field, frames nested within frames, and maddeningly repeated audio cues. Pure audiovisual pleasure, if that's your definition of pleasure. Suzuki's “discovery” by non-Japanese audiences took far too long, but once cinephiles around the globe started mainlining him, they also discovered there was nowhere else to get a fix quite as potent. Plenty of viewers first got hooked with either “Tokyo Drifter” or “Branded to Kill” and not a one has ever regretted the decision. Criterion's SD releases of “Tokyo Drifter” and “Branded to Kill” way back in another century were two of their more disappointing efforts. The details aren't worth going into nearly twenty years later, but at this point they only qualify as collector's items or for “emergency viewing only.” The 2011 Blu-ray upgrades both represent massive improvements. For one thing, they're both 2.35:1 anamorphic transfers, like they're supposed to be! Brighter, whiter colors in the new high-def “Tokyo Drifter”still look like they “bleed” a little bit, but the color arrangements in the film are so audacious and over the top, it's hard to judge exactly how accurate this transfer is. Let's just say it's wild, man. And a whole lot more vivid than the old SD. The black-and-white image in “Branded to Kill” has a lot more depth and detail than the old SD (it's nowhere close) though there are still a few modest signs of print source damage evident in a few places. But nothing troubling. Both films get LPCM mono mixes, and both sound a bit thin and tinny, perhaps because they were meant to in the first place. The “haunted” sound of some of the effects in “Branded to Kill” is actually quite effective. Optional English subtitles support the Japanese audio for both films. Criterion has imported a March 1997 interview with Suzuki (20 min.) from the old SD release. It was recorded at the Nuart Theater in Los Angeles during a retrospective of the director's work, and it's quite engaging. Suzuki exhibits a pragmatic streak, speaking more about business matters than creative decisions, though he is justifiably pleased to speak about how important it is for the director to be the only person who knows what to expect in a film. Criterion also presents a newer interview with Suzuki and assistant director Masami Kuzuu (2011, 12 min.) in which they discuss the production of “Tokyo Drifter.” Suzuki is on oxygen during the interview, but is still quite sharp and entertaining. A Trailer (3 min.) is also included. The 1999 SD had slim liner notes by critic Manhola Dargis. The 2011 re-release comes with a 12-page insert booklet featuring as essay by critic Howard Hampton. The extras are similar to the ones on Tokyo Drifter. Another excerpt from Suzuki's Nuart interview (14 min.) is imported from the 1999 SD. The disc also includes a newer interview with Suzuki and Masami Kuzuu (2011, 12 min.) and a newer interview with star Joe Shishido (2011, 11 min.) A Trailer (3 min.) is also included. Missing from the old 1999 SD is a Poster Gallery from the collection of composer John Zorn who also wrote the slim liner notes for that release. Those notes have been replaced in the 2011 release with a chunkier 16-pager insert booklet featuring an essay by critic, filmmaker, and festival programmer Tony Rayns. There was nobody quite like Seijun Suzuki. And there never will be.